We made three batches and for colour we added one tablespoon of food colouring to each, in red, yellow and orange. To give an extra sensory element to the dough we added one dessert spoon of ground cinnamon to each batch. The easy no cook playdough recipe makes a dough which is nice and soft and which lasts for ages if you wrap it up in clingfilm or in a plastic bag after each play time. 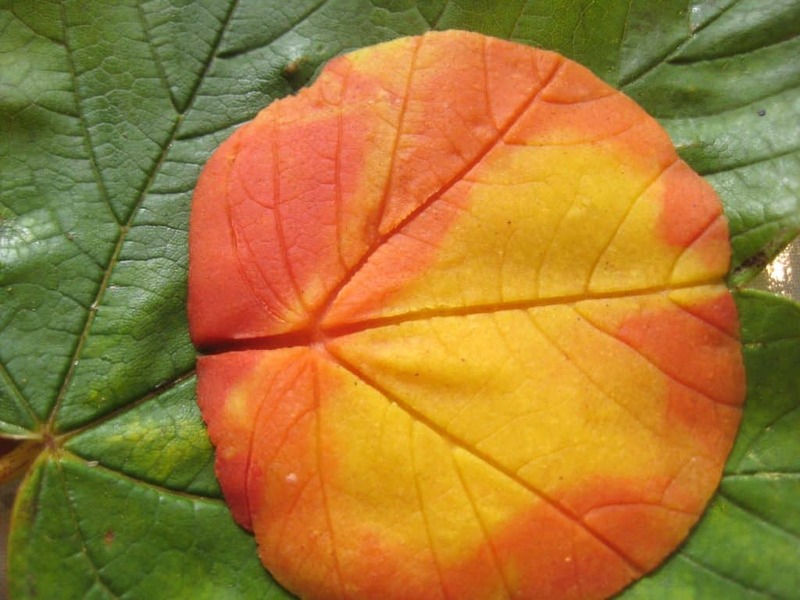 The leaves are already falling here so we gathered some on our way back from school yesterday and used them to make prints in the playdough – which was a great way to really investigate the patterns of veins on each leaf and all the different shapes we found. Playdough is one of our tried and trusted ways for a chilled out afterschool wind-down, providing an activity which is fun but also relaxed – just right after your first day back at school. Thanks for the recipe for No-Cook play-dough. I will definitely do this activity. Sounds wonderful! I’m going to have to make a batch of this once the weather gets cooler and the leaves start falling. 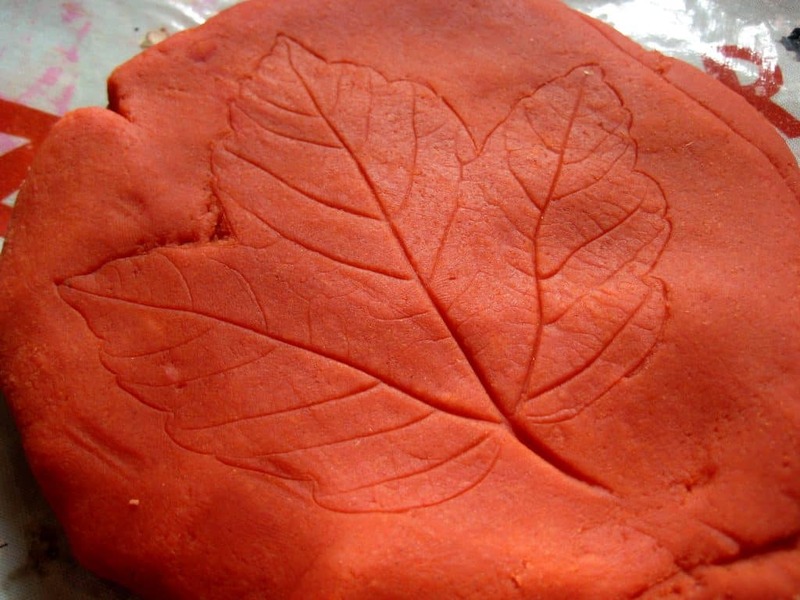 LOVE the leaf prints w/ the playdough! We will have to try this soon! 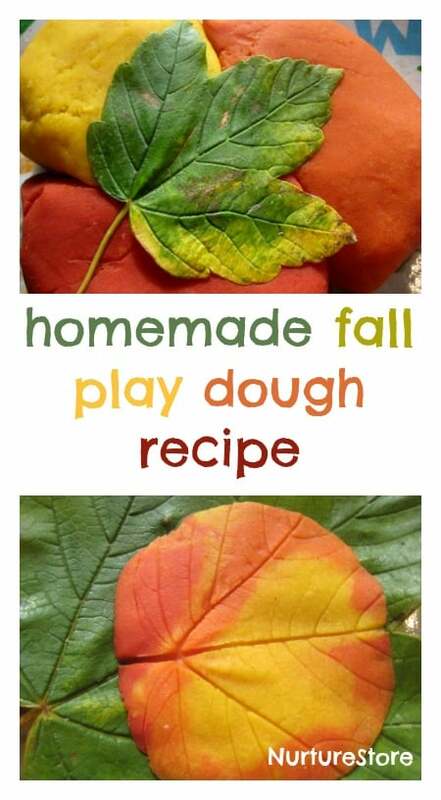 What a great fall activity, I have been meaning to make up a batch of homemade play dough to bring to my Sunday school and my niece and nephew. Thanks for sharing this great idea. I love reading your blog and have used so many of your ideas in my kindergarten class. I love the leaf idea and can’t wait to get to school to do this with my kids. Thank you for sharing! Thank you so much Cheryl. Hope you have lots of playdough fun. What a fabulous idea-I will definitely be giving this a go!! Love, Love, Love this!!! Thanks for sharing, I’m so going to use this when our Leaf week comes up here in a couple of weeks. Thanks again!! Love it! I featured this project at Lines Across My Face in a fall leaf roundup. Wonderful ~ we love playdough activities! 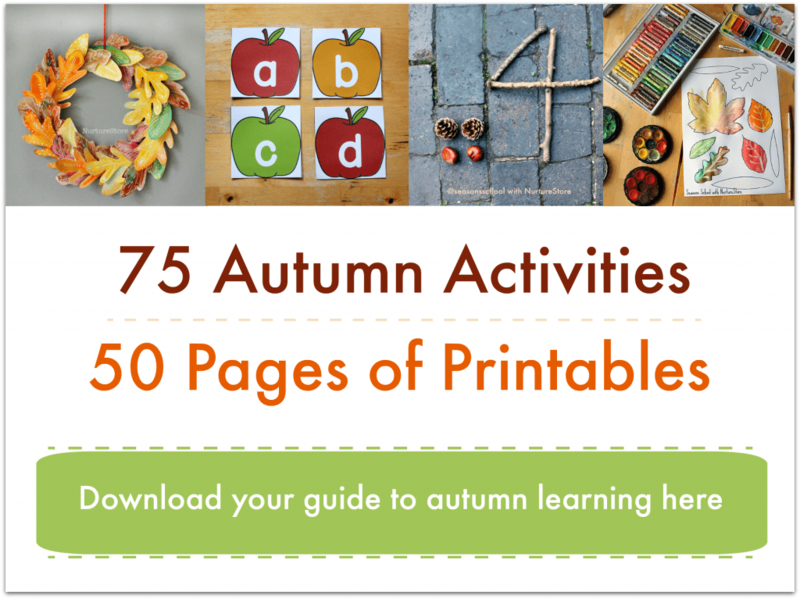 I ADORE leaf prints, they are so beautiful and are a great way for exploring nature.. (we made some last year into bowls – after this guest post – http://www.redtedart.com/2010/10/01/how-to-make-autumn-leaf-bowls-guest-post/ they looked fab). Love the cinnamon element of the playdough. Tacticle and smelly – nice! These are so pretty! I bet they smell wonderful! I love making leaf prints with the dough!